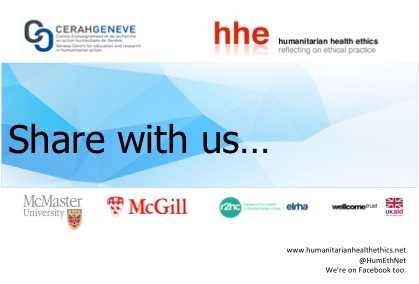 From the 26-27th of September 2018, members of the Humanitarian Health Ethics research group (HHERG) met in Geneva with some of our local research leads and with knowledge users from the humanitarian healthcare sector in Geneva to share preliminary findings from our two R2HC-funded studies (Perceptions of Ebola Research and Ethics and Palliative Care in Humanitarian Settings). The aim of the two day event was to obtain feedback on analysis done to date, validate theories, and gain perspective on ways in which the knowledge gained through research can be applied in humanitarian healthcare policy and practice. Perceptions of Ebola Research During the 2014-15 Outbreak in West Africa. Dr. Elysée Nouvet presenting on 26 September 2018 in Geneva. ​Small Humanitarian Acts that Make All the Difference in End of Life Care? A panel discussion was preceded by Dr. Paul Bouvier as keynote speaker. Dr. Bouvier’s essay “Humanitarian care and small things in dehumanised places” (2012) was the inspiration for applying this lens to our study findings. The event was co-hosted by HHERG and CERAH at the Maison de la paix, Geneva. Audio of the panel presentation is available here: https://humethnet.files.wordpress.com/2018/10/pallcareevening.m4a. During the morning, co-primary investigators Matthew Hunt and Lisa Schwartz presented summaries of the research components. Along with small group discussion, participants were also invited to share thoughts in different ways during and after the day’s events.